Do you wonder how important keywords are when choosing a domain? Are you looking for the perfect domain name that can attract users? This article gives you detailed answers to these questions. Whether keywords are important or not, search engines tweak their algorithms to make it easy for internet users to find what they’re looking for. Adding keywords allows your site to appear easily in search results, but too much of it can make your website look spammy. How Domains With Keywords Were Ranked? There was a time when search engines trusted sites stuffed with keywords. Their algorithms ranked sites according to how they matched queries input by users. Regardless of how complex these algorithms were, the keyword logic showed how relevant a site was. Let’s say a user searches for “cheap houses in London” for example. Google was likely to rank a “cheaphousesinlondon.com” higher than a “house.com”. This is because the keywords matched the site with similar words in its domain. They also believed that a “cheaphousesinlondon.com” would contain more specific content. Choosing a domain stuffed with keyword was much at its peak. Many factors combined to make that site rank higher, including inbound links from other sites and loading speed. However, the domain name was obviously a major detriment. On the other hand, users trusted sites with such domains – perhaps until they realized that most of them were of dubious origin. Website owners and digital marketers took advantage of this logic and began optimising their pages to fit search engines. Domain names started getting longer, with many of them cramming every major keyword within their niche. A lot of sites were also buying inbound links, whilst filling their content with keywords. It was difficult for consumers to find relevant information. This affected user experience and search engines like Google had to upgrade their algorithms to penalize such spammy looking sites. Google then mapped out a list of factors that make a website rank high. Choosing a domain stuffed with keywords wasn’t so relevant, but some websites maintained the technique to easily relate to users. However, stuffing your domain with keywords doesn’t make your site relevant. Creating quality content is what attracts traffic to your page. Therefore, it’s only wise to focus on satisfying consumer’s needs. It is after all humans that want to purchase what you have to offer, and not search engines. In recent times, domain names have not only dropped keywords but have got shorter. Think of the top ten websites you know. You’ll notice how they have short domain names and probably less than two keywords. Most of them only use their brand names and others add no more than one or two keywords. Wouldn’t you rather visit a ‘templatetoaster.com’ than a ‘requestforanewwordpresstemplate.com’? Google has also noticed the preferences of users. That is why they keep upgrading their algorithms to correct it and penalize sites that look spammy. A domain name is one of the main clues by which to identify a spammy site. Instead of the keywords to help your rankings, it keeps users at bay. Therefore, focus more on engaging content and readability. Let users navigate your site easily and create a domain name that represents the ideology of your brand because choosing a domain name stuffed with keywords may lead you to lose. In as much as keywords are important, you should aim beyond just that. Instead of yielding positive results, keywords might have a negative impact on SEO. Even if you wish to set up a WordPress blog as a newbie, you don’t need keywords to help your domain name rise in search results. This post on our blog covers the important elements you need to know. Improve content and make sure the easy access to your blog. Remember, domain names are meant to make web addresses easy to recall. As opposed to an IP address such as 134.96.321.16, a domain name is much easier to memorize. Choose a domain name that speaks volumes, without taking up too many keywords. It’s okay to want a better ranking in search results, but it’s better to have people visiting your site and spending time on it. Increased conversion rate and dwelling time are better than high bounce rates. Don’t see this article as being negatively focused on keywords. As stated earlier, some websites still make use of keywords to help customers relate easily. Therefore, this concept should not be discarded yet. If you can find a way to choosing a domain name that includes a keyword, it can be beneficial – as long as you don’t make your domain name look spammy or appear too lengthy. You can also get inbound links leading to the site to help boost SEO. For example, let’s say you own a brand that resells cars. A domain like ‘car-resale.com’ or ‘automobile-retail.net’ wouldn’t be bad. This way, consumers can easily relate without feeling spooked. When a site links to the page, they can have a sentence like: “You can check out this Automobile Retail outlet”. Such a domain doesn’t look spammy or keyword-stuffed, whilst Google will easily show it in search rankings as well. A domain name like that is easy for any user to relate to. When a user keys in a query like “I need a car retail shop”, your domain then pops up. Backlinks to your site also give your page more credibility and consumers will be certain that your site has a solution to their query. If your car retail store is ‘Rubysshop.com’, it will rarely display on the first page of search results. Users who see a name like that will bypass it for something they can relate to. On the other hand, you can combine the brand name with a keyword. ‘Rubys-automobile.com’ will attract users as well. 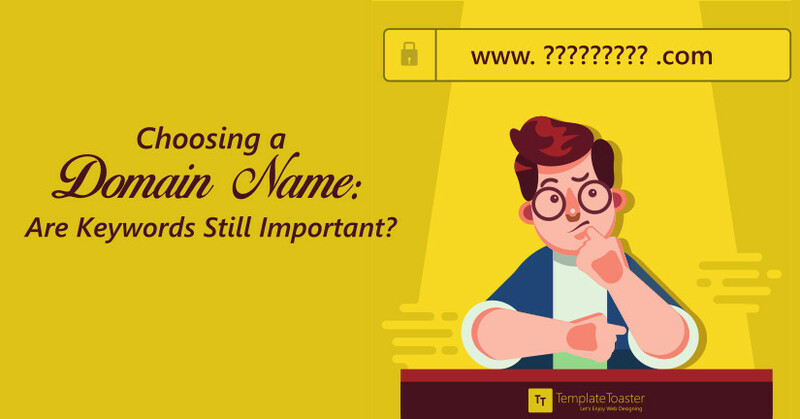 Before you settle on a domain name, ensure you are willing to keep it forever. It’s fine to change a domain name further down the line, but you wouldn’t want to embark on new marketing campaigns just to maintain SEO. Keep the domain name simple, short and make sure it’s also brandable. Take popular search engine, Google, for instance. Would you make use of their site if the domain was ‘lookforeverything.com’? The name ‘Google’ already gives a user an idea of what the site is about. Regardless of the spelling (Google not Goggle), it’s still brandable. Finally, keep in mind that your website is meant to satisfy your customers. Therefore, you need to name your domain with that in mind. Look for names your brains easily memorize them. Your domain name should be one that users can recognize anywhere. Choosing a domain name fabricated with keywords won’t do that. Focus on creating readable and engaging content, as it will always make visitors come back to your site. Once search engines notice traffic on your site, they will definitely follow.